The crowd at Taylor Field soaks in the final Roughriders home game there. 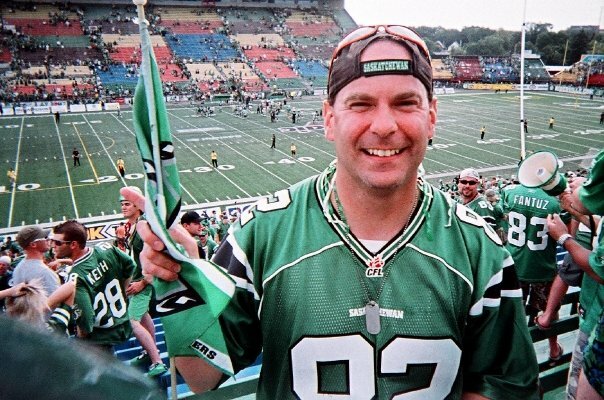 REGINA – Rider Nation truly lived in the moment when it came to attending the last Saskatchewan Roughriders game at Taylor Field/old Mosaic Stadium. On Saturday, Roughriders fans flocked in from all across the province and I dare say even across Canada to be part of the last CFL dance of the historic stadium in Regina. It was a nostalgia trip where one received comfort in reliving the familiar. The atmosphere was similar to a Labour Day Classic or even the game days around the 2007 and 2008 campaign. In 2007 and 2008, game days were surrounded with excitement by the fact the Roughriders were one of the league’s elite teams after about 15 years of being bad to mostly a middle of the pack club. While there were those similarities, the atmosphere was also different. The finality of what was going to take place was in the back of everyone’s minds. This was a night to say farewell and thanks to a park that contains so many great shared memories. The Rider Cheer Team performs a routine on the practice field. People were arriving on Saturday three hours before the 5 p.m. kickoff against the B.C. Lions to tailgate in the parking lots near the facility. The tailgate party on the practice field was also packed. The air was filled with the sounds from the Regina-based rock band Big Bad Storm. The Rider Cheer team also came to put on a special performance to the sounds of the Rider Drum Line. As usual, the Rider Pep Band played outside the stadium’s front gates about 40 minutes before kickoff. At halftime, Canadian country music star and Langenburg, Sask., product Jess Moskaluke got the sellout crowd of 33,427 going with a short but energetic set. The post-game ceremony provided a great light and fireworks show that walked people back through time reliving the history of the place. Jess Moskaluke starred at halftime. There were also huge cheers as mascot Gainer the Gopher took a last lap in his old car with the gopher hole roof. There were also appearances by Roughriders legends George Reed, Roger Aldag and Gene Makowsky, who each emerged from Rider cap jackets like Jedi Knights. Franchise quarterback Darian Durant completed the quartet to give representation for each of the club’s four Grey Cup championship teams, and he also gave a heartfelt address to the fans. Of course, Rider Nation was in top form. A number of Rider fans arrived wearing various trademark costumes. While Halloween was only a couple of days away, game days provide enough reason to dress up. The fans are the reason Taylor Field had the amazing atmosphere it did. Those that went to games became part of a community in a community. The regulars that came to each game got to know the neighbours that sat around them and those that sat at various other spots around the building. In a lot of cases, the regulars only get to see each other on game days. One of the best known regulars is Connie Dobson, who is also known as #TheTravelingRiderFan. She has made the jaunt from Edmonton to Regina for every Roughriders home game for over a decade. She has also followed the team on a regular basis on the road. While cheering hard for the Riders, Dobson also gives credit when the other teams do something well. Over the years, she has befriended and earned the respect of Roughriders players and a number of players from other CFL clubs too. Dobson is the textbook picture of the model fan. Terrell Sinkfield Jr. makes an acrobatic TD catch for the Lions. Speaking of fans, you also saw small representations of fans wearing gear of the Winnipeg Blue Bombers, Edmonton Eskimos and the Lions to ensure their clubs had representation at this monumental game. 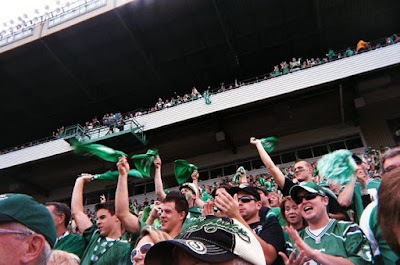 It has become common place for fans of other CFL teams to make the trek to Taylor Field to see at least one game in the legendary park and feel the passion of Rider Nation up close. The only thing that didn’t go to plan was the action on the field during game time. As engaged as the crowd was, the Roughriders fell to the Lions 24-6 and dropped to 5-12 in the standings. B.C. improved to 11-6. All season, the Roughriders have been plagued by struggles on the offensive and defensive line due to injury and personnel turnover. Against the Lions, the Roughriders offensive line missed way too many blocks, and the defensive line didn’t apply much pressure on Lions quarterback Jonathon Jennings. The green and white will need to address both of those areas in the off-season. Roughriders mascot Gainer the Gopher makes one last pass in his old car. In the end, the loss on the field didn’t dampen the night’s festivities. The members of Rider Nation have seen their share of downs, but they always persevere and look forward to next year. Next year provides the chance to back the Roughriders in a new Mosaic Stadium that looks like a palace. It is also specially constructed to trap noise. It won’t take long to indulge in the comforts of the new home park. Even with that in mind, the memories of the old park will never fade away. Logan Fischer (#21) powers his way downfield for the Hilltops. The bigger the game the better Logan Fischer plays. The Saskatoon Hilltops fourth year power running back always seems to have his best games, when the stakes get high for his team. Sunday’s Prairie Football Conference final at Saskatoon Minor Football Field provided another chance to Fischer to add to his big-game resume, and he didn’t disappoint. In an offensive shootout with the visiting Calgary Colts, Fischer scored the Hilltops last three touchdowns, piled up 137 yards rushing on 28 carries and 38 yards receiving on five catches to power his squad to a 43-31 victory. The win marked the third straight year the Hilltops, who improved to 10-1 overall, have won the PFC final and all of those victories have come against the Colts, who fell to 8-3 overall. Fischer had big outings in the two previous PFC title wins. While the Hilltops celebrated another conference title, Fischer was already eyeing up another lofty plateau. With the win over the Colts, Saskatoon advances to the Canadian Junior Football League’s championship game – the Canadian Bowl – for a third straight year and is looking for a third straight in that championship game. Logan Fischer muscles his way in for a TD for the Hilltops. The Hilltops travel to Langford, B.C., which is a suburb of Victoria, on Nov. 12 to face the Westshore Rebels (10-1-1 overall) for the CJFL title. Saskatoon has had two other runs of winning three straight CJFL titles coming in 2001 to 2003 and 2010 to 2012. If the Hilltops can win in Langford, they will pull off a third three-peat in team history and become the first club to win six CJFL championships over a seven-year period. Against the Colts, Fischer admitted the Hilltops came in with some sharper focus after one of the Colts players said some bulletin-board material to a Calgary media outlet regarding his side’s chances of having success on Sunday. The Colts won the only regular season encounter between the two sides 36-21 back on Aug. 28 in Saskatoon. Fischer said he usually goes into a big game with some nervous energy, but Sunday’s game was different. Dylan Minshull powers his way downfield for the Colts. Even with the extra motivation, the Hilltops had to work to put away the pesky Colts. Any time the hosts surged out to a sizable lead, the visitors pushed back. Early in the third quarter, the Hilltops went ahead 22-4, when quarterback Jared Andreychuk hit rookie receiver Rylan Kleiter with a 13-yard scoring toss. The Colts cut the gap to 22-11, when quarterback Bailey Wasdal found Dylan Schrot on a seven-yard pass completion. With 1:30 to play in the third quarter, Fischer broke off a 25-yard touchdown run to push the Hilltops in front 29-11. Early in the fourth quarter, Wasdal hit running back Dylan Minshull on a 15-yard scoring toss to cut Saskatoon’s edge to 29-18. Saskatoon increased its edge to 36-18 one play after recovering a Wasdal fumble, when Andreychuk hit Fischer with a seven yard scoring toss. Minshull proceeded to run in scores from five and 13 yards out to trim the Hilltops lead to 36-31. The Colts failed on a two-point conversion attempt on the first of those two scores. With two minutes to play, Fischer muscled his way in from a yard out to put the Hilltops up 43-31. Saskatoon rookie defensive back Jared Giddings made an interception on the ensuing Calgary series to put any hopes of a comeback by the visitors into miracle territory. “I’m proud we get to live another week,” said Hilltops head coach Tom Sargeant. “We can coach this thing better, and we can play better. Sargeant said it was huge that Fischer had another big outing for his club. “That is who he (Fischer) is,” said Sargeant. “He is one the best players in this league. Receiver Rylan Kleiter (#88) and the Hilltops celebrate their PFC title win. The Hilltops led 15-4 at halftime thanks to a punt single by Des Vessey, a 15-yard touchdown reception by Colin Stumborg from backup quarterback Jordan Walls on a fake field goal and a four-yard touchdown catch by Kleiter from Andreychuk. Kicker Stephen Fabian accounted for Calgary’s first half points on a 28-yard field goal and a rouge from a 36-yard missed field goal. Andreychuk connected on 15-of-23 passes for 154 yards and three touchdown passes for the Hilltops. Wasdal completed 27-of-37 passes for 300 yards, two touchdowns and one interception for the Colts. Minshull piled up 121 yards rushing on 18 carries and caught two passes for 30 yards for Calgary. In preparing for the Canadian Bowl, Sargeant just wants his coaches and players to keep finding ways to get better. “It is always about the process,” said Sargeant. “We keep moving forward. Rachel Johnson (#19) tries to bury a scoring chance for the Huskies. 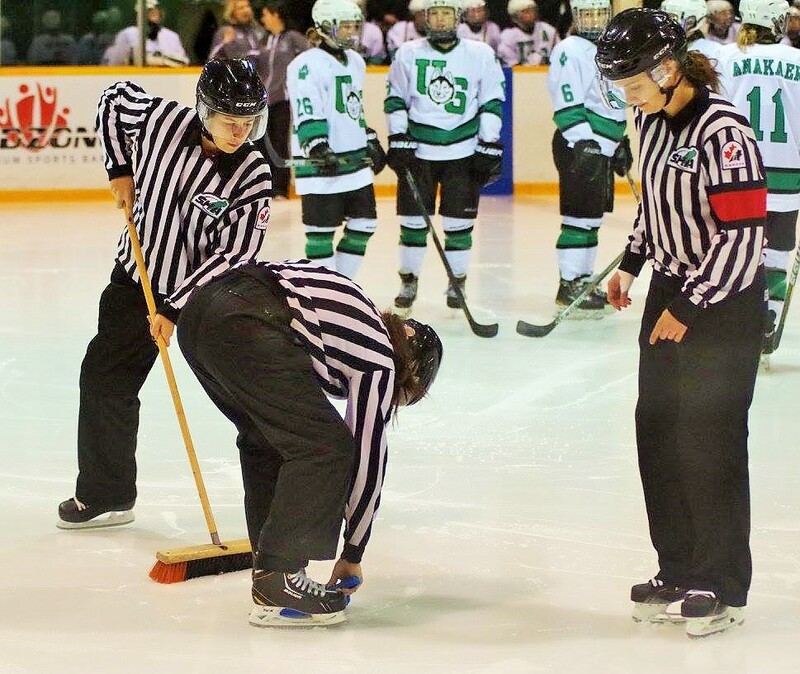 The University of Saskatchewan Huskies women’s hockey team was powerless on the power play, and it cost them their five-game winning streak. 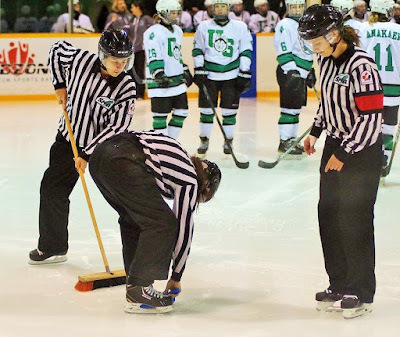 On Friday night at the ancient Rutherford Rink, the Huskies failed to cash in on 11 power-play chances in a 2-0 setback to their provincial rivals the University of Regina Cougars. The Huskies entered the contest riding a five game winning streak, which allowed them to be rated ninth in the U Sports top ten rankings. The Cougars came flying out of the gates scoring twice in a span of 2:20 early in the first period to put the Huskies back on their heels. Feisty forward Kylee Kupper potted the first goal for the visitors while working on a power play and sophomore Jaycee Magwood netted the second tally. Cougars captain Alexis Larson picked up assists on both goals. Alexis Larson picked up a pair of assists for the Cougars. U of R scored once on six power-play opportunities. After getting the early lead, Cougars netminder Jane Kish slammed the door shut in goal making 28 saves to pick up the shutout. She also had a lot of help in front as her teammates cleared away rebounds and also blocked a fair number of shots helping the Cougars improve to 4-3. The Cougars shot blocking started to make the Huskies double clutch in the offensive zone, especially while working on other power play. The U of S players just couldn’t seem to find their flow when they attempted to set up scoring chances. In the third period, the Huskies failed to score on two separated lengthy five-on-three power-play chances. Cassidy Hendricks made 18 stops taking the setback in goal for the Huskies (5-2). The two team go at it again on Saturday in Regina at 7 p.m. at the Co-operators Centre. Tanner Lishchynsky picked up his first U Sports goal. The defencemen for the U of Saskatchewan Huskies men’s hockey team were playing with a hot hand on Friday night in Regina. Three different blue-liners found the back of the net for the Dogs as they downed the host U of Regina Cougars 4-1 at the Co-operators Centre. Captain Kendall McFaull scored in the first period, and fellow rearguards Jesse Forsberg and rookie Tanner Lishchynsky added singles in the second. Lishchynsky’s tally was his first in his U Sports career. The Cougars tried to battle back as Landon Peel scored early in the third, but Parker Thomas restored the Huskies three-goal edge scoring just past the midway point of the frame. Jordon Cooke made 25 saves to earn the win in goal for the Huskies (5-1-1). Andy Desautels turned away 33 shots taking the setback in goal for the Cougars (1-4). The two teams go at it again on Saturday at 7 p.m. at the Rutherford Rink. Colton Klassen (#7) powers in for a Huskies touchdown. The U of Saskatchewan Huskies football team is hitting on all cylinders heading into the post-season. On Friday night before 2,686 spectators at Griffiths Stadium, the Huskies romped over the University of Alberta Golden Bears 48-9. Huskies receiver Chad Braun returned a punt 62 yards for a touchdown to give the Huskies a 7-0 with 5:29 to play in the first quarter. The hosts rolled to 23-0 edge at halftime and led 33-0 at one point in the third quarter before cruising to the finish. The Huskies attack was a balanced one as they piled up 223 yards rushing as a team and 278 yards passing as a team. Starting quarterback Kyle Siemens completed 13-of-25 passes for 188 yards and one interception. Former starter and current backup Drew Burko, who is in his fifth year of eligibility, finished things off for the Huskies in relief connecting on 10-of-14 passes for 90 yards. Tyler Chow topped the Huskies in rushing piling up 79 yards on eight carries, and he scored one major. Colton Klassen ran the ball 10 times for 78 yards and score two touchdowns. Third-year kicker Sean Stenger connected on all six of his field goal attempts. He finished the regular season making 22-of-26 of his field goal attempts. Stenger’s 22 made field goals also set a new Huskies team record breaking the old mark of 19 set by Grant Shaw in 2009. Golden Bears quarterback Ben Kopczynski completed 17-of-36 passes for 170 yards and one interception. He also ran the ball 10 times for 66 yards scoring one touchdown. Kyle Siemens (#19) fires a pass downfield for the Huskies. The two squads also traded safety touches. The Golden Bears finished last in the six-team Canada West conference with a 1-7 mark. The Huskies improved to 5-3 with the win, and they are riding a three-game winning streak heading into the playoffs. U of S could still finish second in Canada West, if the U of Calgary Dinos (5-2) fall to the UBC Thunderbirds (3-4) on Saturday in Vancouver. The Dogs and Dinos split their two regular season encounters, but the Huskies hold a standings tiebreaker having outscored U of C 57-55 in those two contests. If the Huskies host a Canada West semifinal playoff game, it will be held Nov. 5 at Griffiths Stadium. All smiles after a Riders win at 2009 Labour Day Classic at Taylor Field. My mind is working overtime thinking about what this drive will be like. When I leave Saskatoon early Saturday morning for Regina, I will be heading to the Saskatchewan Roughriders final home game at Taylor Field/Mosaic Stadium, which will be the team’s 611th contest at that facility. They face the B.C. Lions at 5 p.m. local time. It is definitely a day I never imagined happening. For generations, many residents from Saskatoon and from all corners of the province of Saskatchewan have made the jaunt to the provincial capital to support the “Green and White.” During that drive on Saturday, I know my mind will be jumping through all sorts of memories. As far as football stadiums in Canada go, Taylor Field holds an esteem similar to that of Lambeau Field in the United States, which is home to the NFL’s Green Bay Packers. Over the last decade, it has been common for fans of other CFL clubs to make the journey to see one game at Taylor Field in order to experience the passion of Rider Nation in person. 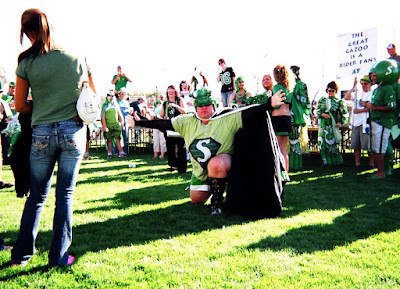 Rider Nation enjoys a pre-game practice field party before a 2006 game. When I first stepped into Taylor Field, I didn’t know how much I would take that place to my heart. A year after moving to Regina, I attended my first Roughriders game on July 26, 1996. The hosts were taking on the powerful Toronto Argonauts led by arguably the CFL’s all-time greatest player in Doug Flutie. The Argos jumped out to a 34-14 lead at halftime and cruised to a 40-16 victory. The Riders were so bad that game it almost hit a comic level. As those that follow the team know, the Riders have had many hapless down stretches. A crowd of 24,902 turned out and filled most of the facility that sat 27,732 at that time. There were those that left early in the fourth quarter, but most of the spectators stayed to the end. I was impressed. Out of the 20 years I had been alive to that point in time, I had lived a total of 16 years in Winnipeg. Football was the sport I loved the most, and I discovered it watching the Cal Murphy era Winnipeg Blue Bombers win Grey Cups in 1984, 1988 and 1990. I went to many games at old Winnipeg Stadium to see the Bombers play. The Bombers were so successful that fan expectations in Winnipeg hit the point that a season that didn’t finish with a Grey Cup win was deemed a failure even in 14-4 and 13-5 campaigns. Fans get pumped up at the 2010 Labour Day Classic at Taylor Field. Watching the Roughriders fall to the Argonauts that warm summer night in July of 1996, I almost couldn’t imagine them ever winning the Grey Cup. That game was also the first time I went to a sporting event where the fans had a good time despite the fact their team was hammered on the scoreboard. I was also just weeks removed from getting dumped by my long time high school sweetheart girlfriend from Winnipeg. For me, stepping foot onto Taylor Field was a move towards becoming more of the community of Regina and Saskatchewan. While I was born in Winnipeg, my family came from Saskatchewan, so this was a return to the roots. My late father’s heart was with the Riders, and I remember him talking about what it was like to go to the deciding game of the 1970 West Final series, where a 14-2 Roughriders team dropped a 15-14 heartbreaker to the Calgary Stampeders at a frigid Taylor Field and fell in a best-of-three set 2-1. The cold heartbreak was pretty large that day. Fans are all set in legendary Section 28 for a 2007 game at Taylor Field. Due to the family ties to Saskatchewan, the Roughriders were always a second favourite team, but they were going to be elevated to a favourite spot. After making my first game at Taylor Field, I began meeting players and coaches from the team due to the fact it was easy to interact with them in the Saskatchewan capital. I started to make regular appearances at Taylor Field to support the people I was getting to know. I remember hanging around with members of the University of Regina Cougars men’s basketball team in the fall of 1998 talking about how we hoped the Riders would go on a big winning streak to save the job of then head coach Jim Daley. Daley’s wife, Diane Hilko, was a gifted assistant coach with the Cougars women’s basketball team, and the Roughriders bench boss frequently appeared on campus. Soon, friends from the University of Regina Rams football team were suiting up for the Roughriders. The link really got solidified as soon as I moved to Medicine Hat for a 10-year stay starting in September of 2004. The Riders Pep Band performs before a game at Taylor Field this year. 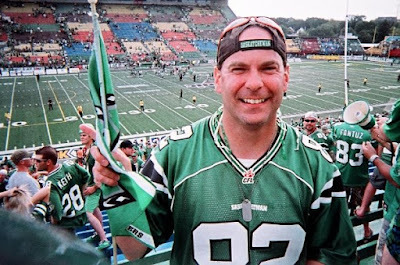 When you left Saskatchewan, your identity was highly linked to the Roughriders, and the passion took another step. I would be part of the mass group of Roughriders supporters that made a few of the team’s road games in Calgary causing those matches to be dubbed the “Christmas Tree” games due to the mix of red and green colours in the stands. When Roy Shivers became the Roughriders general manager in 2000, the brain trust of the team worked to strengthen its links with former Saskatchewan residents that lived across Canada. 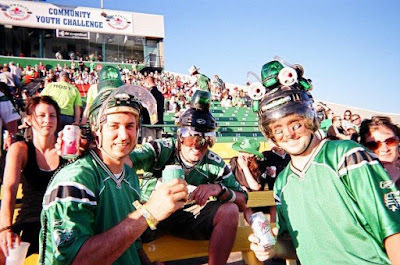 When the team began to have a resurgence in the early 2000s, the Roughriders were boldly marketed as “Canada’s Team,” which is something that sticks to this day long after Shivers tenure with the squad ended. While living in Alberta, the best games were still the ventures back to Regina for visits to Taylor Field. It always felt like a homecoming. The anticipation was always there for the tailgating that went on in various parking lots near the facility and getting to the practice field for pre-game festivities. When the game ended, parties often went long into the night along the nightclub strip on Dewdney Avenue and the early hours the morning. Darian Durant runs for an OT winning TD against the Eskimos this year. Soon, the Roughriders hit new heights with the dawning of the Darian Durant era at quarterback. He joined the team in 2006, was a backup on the 2007 Grey Cup winner, became the undisputed starter in 2009, guided the team to Grey Cup appearances in 2009 and 2010 and led a magical home Grey Cup win in 2013 with a 45-23 victory over the Hamilton Tiger-Cats. I was at that home Grey Cup win, and that is still my best memory of being at Taylor Field. I wished that night would never end. Durant also became my all-time favourite CFL quarterback, and it has been fun watching him lead the Roughriders to many victories. One of the most scrutinized positions in Canadian sport is being the Roughriders starting quarterback. I could see a large number of CFL great signal callers failing in that role. Durant has taken ownership of that position, and you can tell being the Roughriders starting quarterback is important to him. Gainer the Gopher makes his rounds at Taylor Field after a Roughriders TD. All of these thoughts cross the mind as the final Roughriders game at Taylor Field approaches. The Rams will actually close out the facility as they have the potential of hosting three U Sports playoff games there next month. However, Taylor Field’s identity will always be first linked with the Roughriders and Rider Nation. Since moving back to Saskatchewan in late July 2014 and settling in Saskatoon, I have tried to make as many Roughriders games as possible. This last CFL game at the storied park will be an emotional one, and the day and night will no doubt speed by way faster than you would like. The goal is to soak in the one last memory that will be made. If you have any comments about this post, feel free to email them to stankssports@gmail.com. James Reid (#33) watches a potential winning field goal sail wide. It is amazing how the drama can peak for a football game over one kick. With 1:46 to play in a Prairie Football Conference semifinal match, the host Saskatoon Hilltops held a slim 25-23 edge over the Regina Thunder on Sunday at Saskatoon Minor Football Field. Thunder kicker James Reid was setting up to attempt a 23-yard field goal to put the visitors in front. The rookie had made all three of his field goal attempts to that point in the contest booting home kicks from 25, 30 and 38 yards in the first half. It almost felt like a certainty that this kick would split the uprights too, which would have put the Thunder, who were 5-4 in the regular season, on the verge of upsetting the Hilltops, who had an 8-1 regular season record. When Reid booted his late attempt, the ball went high in the air and seemed like it took forever to reach the uprights. At what seemed like the last second, the kick drifted just wide to the left resulting in a single point. That 25-24 scored held up as the final outcome as the Hilltops, who have won the last two Canadian Junior Football League titles, advanced to the PFC final. Adam Benkic, second from right, celebrates scoring a TD off a blocked punt. They will host the Calgary Colts this coming Sunday, Oct. 30 at 1 p.m. at SMF Field. The Colts slipped past the Edmonton Huskies 11-10 in the other PFC semifinal held in Calgary on Sunday. The Hilltops win over the Thunder showed how big special teams can be in the game of football. Leading 18-9 at halftime, the Hilltops only score in the second half came as a result of special teams. Just past the midway point of the third quarter, Hilltops linebacker Cody Peters blocked a Thunder punt deep in the Regina end of the field. The ball rolled into the end zone and it was recovered by Hilltops linebacker Adam Benkic to put the hosts up 25-9. The Hilltops ultimately needed that score to withstand a Thunder comeback attempt. That play combined with the Thunder missed kick proved to be the difference in the contest. Hilltops RB Logan Fischer collides with Thunder DL Carson Bell. In the same breath, Reid shouldn’t have to shoulder the blame for the Thunder’s loss. When you get a 3-for-4 performance from a rookie kicker who is just out of high school in a do-or-die playoff game, any post-secondary football team will take that performance. Had the Thunder driven for a touchdown on one of the four drives that culminated in a Reid field goal attempt, the late kick might not have been needed. On the late drive that resulted in Reid’s miss, Regina got down to Saskatoon’s six yard line. In getting to the six, the Thunder were close to breaking a couple of separate plays for a go-ahead touchdown. When they got to the Saskatoon six yard line, the Thunder were facing a third and two, but elected to try for the kick. They took a time count violation on purpose to set up a better angle for go-ahead field goal. They could have gambled on the third-and-two, because they were starting to break into the end zone. Sawyer Buettner fires a pass downfield for the Thunder. After falling behind 25-9, Regina drove for a pair of major scores. First, quarterback Sawyer Buettner scored on a one-yard sneak near the end of the third quarter. Then PFC rushing leader Victor St. Pierre-Laviolette ran in a touchdown from 10 yards out with 8:11 to play in the fourth quarter to cut Saskatoon’s lead to 25-23. On the drive that resulted in Reid’s miss, a Thunder third-and-two gamble from the Saskatoon six yard line likely would have had the same drama as the kick attempt. When the dust settled, spectators at SMF Field were treated to a post-season classic tilt between the two teams. The Hilltops jumped out to a 14-0 lead in the first quarter. Hilltops quarterback Jared Andreychuk hit veteran receiver Ryan Turple with a 24-yard touchdown pass for Saskatoon’s first major, and running back Logan Fischer ran the ball in from two yards out for the second major. James Vause hit a 29 yard field goal and recorded a single point off a 38 yard missed field goal in the second quarter to round out Saskatoon’s scoring. QB Jared Andreychuk sprints downfield for the Hilltops. Buettner completed 24-of-43 passes for 316 yards for the Thunder. Andreychuk connected on 15-of-35 passes for 204 yards and one touchdown strike for the Hilltops. The Hilltops swept the season series claiming a 20-18 victory on Sept. 10 in Saskatoon and a 30-26 win on Oct. 1 in Regina. The Hilltops have won the last five straight meetings between the two sides including play in the regular season and playoffs. Now, the Hilltops move on looking to down the Colts for a third straight year in the PFC final. The Colts finished second in the PFC with a 7-2 mark, but they beat the Hilltops in the only meeting between the two sides this season 36-21 on Aug. 28 at SMF Field. Another post-season classic possibly looms around the corner. Jesse Forsberg celebrates his OT winner. A pair of Jesse Forsberg point blasts broke the hearts of the University of Lethbridge Pronghorns men’s hockey team. On Friday night at the ancient Rutherford Rink, the Pronghorns led the host University of Saskatchewan Huskies 2-1 going into the third period before Forsberg stepped up to the forefront. At the 11:55 mark of the third, the third-year defenceman wired a point blast past Pronghorns goaltender Garret Hughson to tie the contest up at 2-2. The contest proceeded to go to overtime, and at the 3:31 mark of the extra session while working on a four-on-three power play, Forsberg drove home the winner from the point to give the Huskies to a 3-2 victory. During the Huskies first five games, Forsberg has jumped out to a fast start netting three goals and three assists. The Waldheim, Sask., product is looking to surpass his Canada West career high totals of three goals and seven assists recorded in 16 regular season games last season. Forsberg’s heroics allowed the Huskies, who are rated third in the U Sports top 10 rankings, to find a way to improve to 4-1 against a foe that came out playing at a high level. In the opening frame, the Pronghorns had the Huskies pinned for lengthy stretches in their own zone holding a 17-6 edge in shots on goal. Thanks to stellar play of netminder Jordan Cooke, the hosts exited the first 20 minute locking in a 1-1 draw. Third-year centre Justin Valentino beat Cooke on the power play during a net scramble to put the Pronghorns up 1-0. The Huskies gained some traction when Logan McVeigh and Carson Stadnyk combined to set up Michael Sofillas for his third of the season to force a 1-1 tie with 2:50 remaining in the first. Josh Roach charges into the offensive zone for the Huskies. The teams played an even second, but Cooke had to make a few bailout saves, when the Huskies made a number of turnovers in the centre ice zone. One of those turnovers did result in Valentino’s second of the night to give the Pronghorns a 2-1 edge with 6:07 to play in the second. After U of L received a giveaway in the centre ice zone, Valentino score after his side applied a stretch of sustained pressure in the offensive zone. The Huskies came out flying in the third playing their best hockey of the contest. After Forsberg picked up the equalizer, he almost didn’t have a chance to be the overtime hero. In the dying seconds of the third period, Huskies captain Kendall McFaull was set up alone at the side of the Pronghorns goal, but Hughson stretched over to deny the scoring chance. Cooke made 33 saves to pick up the win in goal for the Huskies. Hughson turned away 30 shots to take the extra time setback in goal for the Pronghorns, whose record moved to 1-1-1. The U of Saskatchewan Huskies women’s hockey team won their fourth straight game overcoming a hot opposing goaltender. On Friday night in Lethbridge, U of Lethbridge Pronghorns netminder Alicia Anderson had a sensational outing making 43 saves, but the Huskies, who are rated 10th in the U Sports top 10 rankings, weren’t kept at bay forever. They skated away with a 4-2 victory. Aislinn Kooistra gave the Pronghorns a 1-0 lead at the 5:40 mark of the first. The Huskies found the equalizer with 3:11 to play in the first, when sophomore winger Courtney Cormack netted her first of the season. U of S surged ahead 3-1 in the second, when fourth year veterans Kaitlin Willoughby and Kori Herner both netted singles. Jodi Gentile scored for the Pronghorns to cut the Huskies edge to 3-2 heading into the second intermission. Sophomore forward Shyan Elias scored for the Huskies on the power play in the third to help the visitors seal victory. Former Swift Current Wildcats star netminder Jasey Book turned away 14 shots to pick up her first career regular season victory for the Huskies in her first start. The Huskies improved to 4-1 with the win. The Pronghorns fell to 1-3-1 with the loss. Anderson, who is in her second season with the Pronghorns, has stopped 160-of-169 shots in three starts in the current campaign to post a .947 save percentage and a 2.98 goals against average. She has faced an average of 56 shots a game. The two teams go at it again on Saturday in Lethbridge. On Thursday, the governing body for university sports in Canada launched a re-brand of its name and logo. From now on, the governing body that was known as Canadian Interuniversity Sport (CIS) will now be known as U Sports. The U Sports name will be used in both English and French. It oversees the competition involving teams at 56 universities, a total of around 12,000 student athletes, about 500 coaches and 21 national championships in 12 different sports. The logo is a simple standing “U” with a maple leaf in the middle. The maple leaf in the new logo evolved from a unique leaf found on an old CIAU (Canadian Interuniversity Athletic Union) letterhead from the 1980s. The governing body for university sports in Canada ran under the CIAU name until switching to the CIS name in 2001. The change comes under the watch of current U Sports CEO Graham Brown, who was hired in the fall of 2015. In recent years, there has been some talk about changing the name for the governing body for university sports in Canada to a moniker that was viewed as less clunky. The U Sports name definitely achieves that objective. While it is not normal for a league to change its name in the middle of a season, the change still came during the early stages of the university sports season in Canada. The streamlined name comes just in time before most of the fall semester only sports begin their respective playoff cycles. The early reviews for the new name have been good, so here is hoping the re-branded U Sports will be able to attract more national attention and sponsorships it deserves. Hilltops running back Logan Fischer charges through the Thunder defence. The first round of the playoffs won’t be a breeze this time for the Saskatoon Hilltops. Usually when the Toppers top the Prairie Football Conference standings, they open the playoffs taking on an opponent in a PFC semifinal match that will have a post-season feel but victory will still almost be a certainty for the venerable Canadian Junior Football League team. After finishing first in the 2016 campaign with an 8-1 mark, the Hilltops open the playoffs with a rivalry game. On Sunday at 1 p.m. at Saskatoon Minor Football Field, the Hilltops host the Regina Thunder in a PFC semifinal match. The Thunder finished fourth in the conference with a 5-4 mark, where two of their losses came to the Hilltops and two came against the second place Calgary Colts (7-2). Both of the head-to-head matches between the Hilltops and Thunder were close. On Sept. 10, the Hilltops slipped past the Thunder 20-18 at SMF Field. On Oct. 1 in the final clash between the two clubs at old Mosaic Stadium, the Hilltops trailed the Thunder 26-16 with 2:21 to play in the fourth quarter but rallied for a 30-26 victory. Sawyer Buettner had a strong season starting at QB for the Thunder. Saskatoon also took both head-to-head meetings last season. The Hilltops and Thunder know each other extremely well, and both teams are led by strong coaching staffs with Scott MacAulay heading the Regina side and Tom Sargeant leading the Saskatoon side. The two clubs have combined to win the last six straight CJFL championships, with the Thunder claiming victory in 2013 and Hilltops capturing the Canadian Bowl in 2010, 2011, 2012, 2014 and 2015. Both teams will likely try plays on Sunday they haven’t run all season to catch each other by surprise. It is common for teams to practice a certain set of plays all season that aren’t used in games, so they don’t show up on any video. When it comes playoffs, these plays are unleashed. The Thunder are entering this contest with a lot of confidence coming from two straight wins. The first of those victories came on Oct. 9, when the Thunder downed the Colts 30-23. After some frustrating setbacks against the conference’s two top teams, that win will give the Thunder traction for getting over a hump. Jared Andreychuk surpassed 2,000 passing this season for the Hilltops. The Hilltops head into the post-season with six-straight wins. Their only loss came back on Aug. 28, when they dropped a 36-21 decision to the Colts at SMF Field. Since that time, the Toppers have improved greatly, and their play is resembling the level that saw them with the CJFL championship in each of the last two years. Regina heads into the clash in capable hands at quarterback. Second year Moose Jaw product Sawyer Buettner has had an outstanding season completing 153-of-230 passes for 1,912 yards, 10 touchdowns and 11 interceptions. He missed the Thunder’s last game due to an undisclosed injury, when they thrashed the Wildcats in Edmonton 69-18. Rookie Brock Sich started that contest completing 20-of-28 passes for 352 yards, five touchdown passes and one interception. The Thunder have a whole host of playmakers on both sides of the ball, which makes them a big threat to create an upset. They are the last club to defeat the Hilltops in the playoffs with a 21-16 victory in the 2013 PFC final in Saskatoon. RB Victor St. Pierre-Laviolette tears downfield for the Thunders. Saskatoon has the edge in intangibles as the Hilltops always seem to rise to the occasion when a big challenge is ahead of them. They get a huge boost of confidence from the fact that they are led by fifth-year quarterback Jared Andreychuk. Andreychuk is the team’s unquestioned fearless leader who is able to immediately bring his side up to another level. With him at the controls, the Hilltop almost have an aura that no matter what bad things happen to them in a game they will find a way to win. Throwing to almost a new group of regular receivers, Andreychuk had arguably his finest year with the Hilltops completing 121-of-203 passes for 2,008 yards, 22 touchdown passes and seven interceptions. He is surrounded by a group on both sides of the ball that can make plays at any time. The rivalry between the Thunder and Hilltops is relatively a new one with the Regina side hitting the field for its inaugural season in 2000. For about the past seven years, it has become one of the most compelling rivalries in the Canadian junior and post-secondary ranks. Two Hilltops defenders take down Thunder OL Brayden Moroz. Both sides also mirror each other in conducting themselves with great class. While they will go to war on the field, the two teams do have a genuine respect for each other when the game is over. On Sunday, you can expect them to hold another classic. When the dust settles after that clash, the winner has a good chance of ensuring the Canadian Bowl stays in Saskatchewan for a seventh straight season. Officials clean up fallen rust at the Rutherford Rink. The “rust break” will become a thing of the past. Anyone connected with the University of Saskatchewan has to be breathing a big sigh of relief that the ancient Rutherford Rink will be replaced in a more sooner than later time span. Last Thursday, Rutherford was the site for the public launch of the Home Ice Campaign, where U of S commerce and law graduate Merlis Belsher contributed $12.25-million to fund a new ice facility to replace the current home of the Huskies men’s and women’s hockey teams. The donation was the largest donation from an alumnus and individual in the university’s history. One day later, Lawrence and Patricia Rychjohn and Ian and Alice Van Norman donated $1-million to the campaign after a ground breaking ceremony for a new hotel development on campus. Thanks to those incredible gifts, $34-million has been raised for the new twin-ice facility, which will cost $41-million and be called Merlis Belsher Place. It will eventually be built south of the Field House. A picture of what the rink will look like drew good reviews at the launch and through circulation on social media. The only thing that would have made the launch announcement better would have been a ground-breaking ceremony for the new arena. That detail still helps a minor anxiety linger about the whole project. The Huskies men's hockey team celebrate a goal at the Rutherford Rink. Even with that in mind, the campaign is only looking for the public to raise the remaining $7-million to complete everything. With $34-million already raised and legendary former Huskies men’s hockey head coach Dave King leading the charge, the new rink will be built. The question is only when? Since 1997 when then Huskies athletic director Ross Wilson said he was actively pursuing a new rink, it felt like the process to replace Rutherford had way too many stops and starts. One had to wonder if a new facility would ever be built, or it felt like the current facility that was built in 1929 would have to be condemned to get any more action under way. Those with long memories know the Physical Activity Complex on campus was built due to the fact the U of S’s Physical Education Centre was found to be no longer structurally sound in December of 1997. Within months of that discovery, the Physical Education Centre was demolished. When the Physical Activity Complex opened in 2003, it replaced Education Gym as the home of the Huskies basketball and volleyball teams. As far as the new rink front goes, there appears to be no stopping its inevitable construction now. When King became involved, you knew the will was there to get the project done. Belsher along with the Lawrence and Rychjohn families showed outstanding community minded leadership with their donations. The twin ice surfaces will provide ice time for the Huskies hockey teams, 900 students who play campus recreation hockey annually, 400 students and 140 faculty and staff for other recreational and academic purposes and Saskatoon Minor Hockey Association teams. A sign for the Home Ice Campaign. The facility will have a 90-foot wide main surface, seating for 1,830 with the ability to expand to 2,310 spectators and flex space for events like convocations. In Rutherford, hockey games often have to be stopped, when a puck hits the ceiling causing rust from the beams to fall on to the ice. The rust has to be cleared off before play can resume, which caused the term “rust break” to become a norm. A new rink will put a thankful end to rust stoppages. Until the last $6-million is raised, there will be a bit of an anxious wait, but this time there is more certainty than ever of a positive end result. For those that want to donate to the Home Ice Campaign, they can do so by clicking here. A documentary that explores the world of the hockey enforcer is set to open in Saskatoon, and it looks to be a good one. “Ice Guardians” is slated to be shown at the Remai Arts Centre at 6:30 p.m. on Monday. The film features some of the game’s most famous pugilists including Dave Schultz, Dave Semenko, Joey Kocur, Kelly Chase, Rob Ray and the late Derek Boogaard. In exploring the role of the enforcer, the premise of the movie is to show the human side of the men that took the ice to protect superstars like Wayne Gretzky and Brett Hull. One of the observations was the fact enforcers wanted to make the NHL, but they didn’t think growing up they would live the dream by throwing fists. One of the players featured was former Philadelphia Flyers enforcer Riley Cote. Cote was the 19-year-old captain of the Prince Albert Raiders, when I covered that WHL team during the 2001-02 campaign. At that time, Cote was known for this toughness, which is a traditional trait you see coming from members of the Raiders. He won his share of fights in the major junior ranks. The Winnipeg product was also making a reputation for his offensive skill. During the 2001-02 campaign, Cote collected 28 goals and 23 assists in 67 regular season games along with 134 penalty minutes. He was in tremendous physical shape and had quite an impressive build. Cote was known for being a teddy bear. He wasn’t even tagged as the enforcer of the Raiders. One thought he would make the NHL as a power-forward type player like Keith Tkachuk. 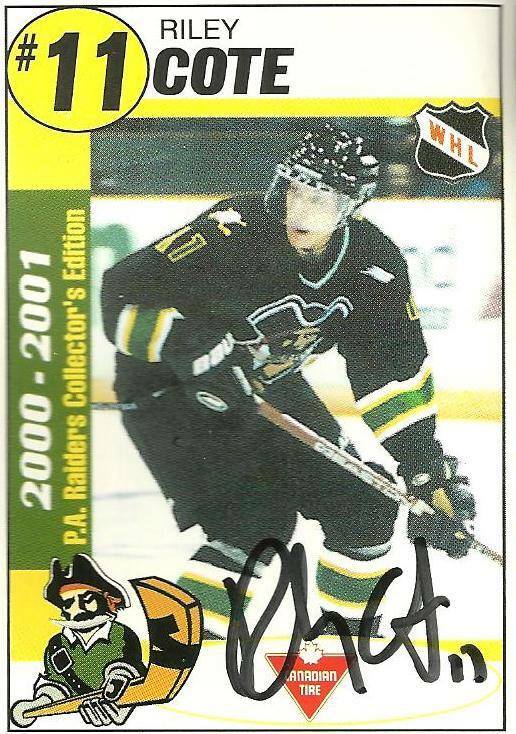 During the off-season months in 2002, Cote signed his first professional contract ensuring he wouldn’t be back for his overage season in Prince Albert. Soon, I was hearing stories that Cote was slugging it out in hockey’s minor professional ranks as an enforcer. He eventually made his NHL debut with the Flyers on March 24, 2007. He played in 156 career regular season games with the Flyers collecting one goal, six assists and 411 minutes in penalties. In 70 games in the 2007-08 campaign, Cote spent 202 minutes in the sinbin. During his NHL career, he was viewed as one of the Flyers best representatives out in the community, and he was always a fan favourite. Cote is one example that there is more to an enforcer type player than just getting into fights. You also find out a number of them are fairly intelligent and are well-versed in all sorts of subjects. The “Ice Guardians” documentary aims to show all these other characteristic of enforcers. Those that purchase a $100 VIP ticket will get to attend a reception before the movie at Milestones with Chase and Kocur, a question and answer session with NHLers after the film and an after party. General admission tickets are $45, which also gets you into the question and answer session and the after party. The Hilltops defence swarm in on a Rifles ball carrier. The stars lined up for the Saskatoon Hilltops to allow the venerable Canadian Junior Football League team to once again finish on top of the Prairie Football Conference standings. Heading into the final weekend of regular season play, the Hilltops needed some help when it came to finishing first in the PFC. Saskatoon needed to win its final game, while the Calgary Colts, who were holding on to top spot, needed to fall in their final outing. On Saturday, the Colts traveled to Edmonton and fell to the red hot Edmonton Huskies 51-35. The loss dropped the Colts to 7-2, while the Huskies improved to 6-3 riding a five-game winning streak. The Huskies last loss came back on Sept. 3, when they were thumped 43-4 by the Colts in Calgary. That opened the door for the Hilltops, who seized their opportunity to lock up home field advantage through the PFC portion of the post-season. On Sunday in Winnipeg at Charlie Krupp Stadium, the Hilltops thumped the Rifles 44-14. The win allowed the Hilltops, who have won six straight, to improve to 8-1 to finish on top of the PFC standings. Hilltops quarterback Jared Andreychuk stays cool under pressure. Saskatoon will host a PFC semifinal match this coming Sunday against their provincial rivals the Regina Thunder at 1 p.m. at Saskatoon Minor Football Field. The Thunder, who have won two straight, thrashed the Wildcats in Edmonton 69-18 to finish fourth in the PFC. Against the Rifles, the Hilltops went ahead 7-0 on their first offensive drive that was capped by a 10-yard touchdown run by star running back Logan Fischer. The Rifles tied things up at 7-7, when their star running back Michael Ritchott ran in a major score from 44 yards out. The Hilltops then proceeded to quickly put an end to the competitive part of the game at that point. Before the first quarter ended, they surged ahead 21-7. First, quarterback Jared Andreychuk connected with receiver Jason Price on a 22-yard touchdown strike, and then Fischer ran in a major from a yard out for his second touchdown of the day. In the second quarter, Andreychuk found receiver Ryan Turple for a 27-yard touchdown toss, and fullback Colin Stumborg ran in a score from five yards out to put the visitors up 35-7. The Hilltops began to liberally substitute in all their backup players from that point. Jason Price (#83) had a 22-yard TD catch for the Hilltops. Saskatoon’s scoring was rounded out in the second half by a pair of field goals from James Vause, a punt single from Des Vessey and a conceded safety by the Rifles. Ritchott ran in a major score from 16 yards out to complete the Rifles scoring. Andreychuk completed 6-of-9 passes for 121 yards and two touchdown passes. He surpassed the 2,000 yard mark in passing for the season before being relieved by backup quarterback Jordan Walls late in the second quarter. Fischer piled up 57 yards rushing on eight carries in the win. Rookie Joshua Ewanchyna led the Hilltops with 104 yards rushing on 12 carries. Price had 134 yards receiving on four catches for Saskatoon. The Hilltops enter the post-season trying to win the Canadian Bowl for a third year in a row and also become the first team in history to win six CJFL titles in seven years. Logan Fischer (#21) ran in a pair of touchdowns for the Hilltops. They won both their head-to-head meetings with the Thunder this season, but both encounters were tight. On Sept. 10 in Saskatoon, the Hilltops slipped past the Thunder 20-18. On Oct. 1 at old Mosaic Stadium in Regina, the Hilltops trailed the Thunder 26-16 with 2:21 to play in the fourth quarter but rallied for a 30-26 victory. This coming Sunday, the second place Colts host the other PFC semifinal against the third place Huskies. The Rifles missed the playoffs finishing fifth in the PFC at 2-7, while the Wildcats finished last with an 0-9 mark. Adam Benkic (#40) celebrates returning a fumble for a touchdown. I was back in the Saskatoon Express this past week with a story on brothers Adam and Cole Benkic of the Saskatoon Hilltops. The story focused more on Adam, who went from playing quarterback in high school to outside linebacker with the Hilltops. Adam is in his third year with the Hilltops and has seen his role with the club increase in starting most of the team’s games. Cole is in his fifth and final season with the Hilltops. Last year, he was named the CJFL’s defensive player of the year, and coming into this season, he was rated number one in a promotion that listed the league’s top 50 players. Unfortunately for Cole, he injured his leg in a pedal bike crash in the off-season, and hasn’t suited up for any of the Hilltops regular season games. He is close to returning, but is still officially week-to-week. Cole Benkic in action for the Hilltops last season. Cole has been at all the Hilltops practices and games helping the rest of the team’s linebackers with coaching tips. In his absence, middle linebacker Cameron Schnitzler and outside linebackers Cody Peters, Bobby Ehman and Adam Benkic have all improved greatly. Schnitzler and Peters have both had stellar seasons. Peters had really become a beast on the outside. When Cole returns, the Hilltops linebackers will become that much stronger. The story on the Benkic brothers can be found right here. If you have comments to pass along about this post, feel free to email them to stankssports@gmail.com. Pandas F Autumn MacDougall is stopped by Huskies G Cassidy Hendricks. Coming out of the gate, it appeared the University of Saskatchewan Huskies women’s hockey team was facing a murderous schedule. In their first four games, the Huskies had to hit the road to take on the defending Canada West champion University of British Columbia Thunderbirds twice, and then they returned home to host the University of Alberta Pandas, who are always a conference powerhouse, twice. On paper, a split in each series would be considered a great success for the Huskies. There was also a realistic chance the Huskies could play well and still come out of that stretch without a win. Kaitlin Willoughby netted the shootout winner for the Huskies. Under first year head coach Robin Ulrich, the Huskies weren’t phased by the early challenge. After dropping their regular season opener 4-0 in Vancouver to the Thunderbirds on Oct. 7, the Huskies have rolled off three straight wins. After falling to the Thunderbirds, the Dogs rebounded the next night downing UBC 5-3, which ended a streak where the Thunderbirds had won eight straight meetings between the two squads. On Friday, the Huskies opened their home schedule at the ancient Rutherford Rink with a 2-1 double overtime victory over the Pandas. Offensive defender Leah Bohlken blew home the winner on the power play on a perfect backdoor feed from star winger Kaitlin Willoughby. On Saturday at Rutherford, the Huskies completed the sweep of the Pandas pulling out a 2-1 victory after a tiebreaking shootout. Willoughby was the first shooter up in the shootout and netted a beauty goal on a deke that totally fooled Pandas goaltender Dayna Owen. That turned out to be the only tally in the tiebreaking session. Veteran Huskies goalie Cassidy Hendricks slammed the door on the three Pandas shooters she faced to deliver her side to victory. Rachel Lundberg (#15) celebrates her short-handed goal. When you play tough opponents like the Thunderbirds and Pandas, who were rated eighth in the Canadian Interuniversity Sport top 10 rankings, the key is to just to find a way to win. That is what the Huskies have done, and Saturday’s game provided the perfect example of just finding a way to get to right side of the scoreboard. The Huskies weren’t always at their best. Had it not been for the stellar play of Hendricks, who made 29 stops through regulation and 10 minutes of overtime play, the Huskies wouldn’t have pulled out a sweep. The Pandas had the Huskies pinned in their own zone for much of the first period, and at one point, the visitors had a 9-1 edge in shots on goal. U of A was winning every race for loose pucks and taking what seemed like every physical battle for the puck. Hendricks was under siege, but the fifth-year standout from North Vancouver played with a trademark calm that has defined her whole university career. She was going to hold her team in the game until her teammates could find some traction. When the first 20 minutes ended, the Pandas had outshot the Huskies 16-7. The visitors could have had at least a three-goal edge on the scoreboard, but the two sides were locked in a 0-0 draw. Rookie Kayla Kirwan has been solid for the Huskies. The hosts found the traction they were looking for early in the second. While on the penalty kill, fifth year defender Alyssa Dobler sprung hard-working second-year forward Rachel Lundberg on a breakaway. Lundberg broke into the Pandas zone, wired her first shot off the post, collected the rebound and beat Owen to give the Huskies a 1-0 lead. The Dogs found their skating legs, and they played fairly even for the rest of the contest with the Pandas. In the third, the Huskies ran into some penalty trouble, which allowed the Pandas to pull even. Playing with a two-person advantage, Pandas sophomore forward Autumn MacDougall buried her second of the season to tie things up at 1-1 shortly before the seven minute mark. Before going to overtime, the Pandas had a glorious chance to pull ahead. Third-year forward Amy Boucher found herself on a breakaway late in the third, but she fired a shot wide of the goal. During the second five-minute overtime period, Owen had to make a big save on Willoughby, when the Huskies were pressing with all sorts of pressure around the U of A net. That set the stage for the shootout, where Willoughby made no mistake in potting the only goal in the tiebreaking session to give her team the win. The Huskies improved to 3-1 as a result. The Huskies celebrate their shootout victory against the Pandas. Owen turned away 22 shots over 70 minutes and two of the three shooters she faced in the shootout as the Pandas record moved to 2-0-2. Besides getting clutch contributions from their veterans, the Huskies have also received strong performances from rookie defender Kayla Kirwan and rookie forward Emily Upgang. After three big wins in a row, the Huskies now encounter their next challenge, when they hit the road to Lethbridge for two trap style games this coming Friday and Saturday against the University of Lethbridge Pronghorns. The Pronghorns are 1-3, but they have always found a way to give the Huskies difficulties. For the moment, the Huskies can take pride in their surprising good start. In the back of their minds, they have to ensure they don’t get too high, so they can focus on their next challenge and keep finding ways to win. Kohl Bauml had a hat trick to lead the Huskies to a big road win. Kohl Bauml put the U of Saskatchewan Huskies men’s hockey team on his back to power them to a huge road victory in Edmonton. On Saturday, Bauml fired home a hat trick to lead the defending Canada West champs past the U of Alberta Golden Bears with a 4-2 victory at the Clare Drake Arena. Bauml’s third goal broke a 2-2 tie just 55 seconds into the third period. Huskies captain Kendall McFaull added a big insurance marker just past the midway point of the third to cement a two-goal victory. Goaltender Jordon Cooke made 32 saves to give the Dogs a split in their weekend series with their forever rivals. The Bears picked up a 3-2 double overtime victory on Friday. In Saturday’s encounter, Jayden Hart and Cole Linaker had singles for the Bears, while netminder Kenny Cameron turned away 24 shots taking the loss in goal. With Saturday’s win, the Huskies, who are rated third in the CIS top 10 rankings, improved to 3-0-1. The Bears, who are rated fourth in the CIS top 10 rankings, fell to 1-1. The Huskies return to action this coming Friday and Saturday when they host the U of Lethbridge Pronghorns (1-1) at 7 p.m. on both nights at the Rutherford Rink. Can hockey Huskies roll again?